Spanish Colonial is the most decorative of the Spanish styles, and its ornament covers a wide range of source materials from Moorish to Renaissance and Byzantine. The elaborate and intricate ornamental forms of Old World Spanish buildings, called Churrigueresque (Spanish baroque) ornament, were a hallmark of expensive high-styled buildings. 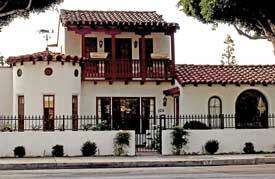 The Spanish Colonial Revival style gradually replaced the Mission Revival style in popularity as it was considered to be more authentic. The style was heavily influenced by the opening of the Panama Canal, the Spanish Colonial buildings at the 1915 Panama-California Exposition in San Diego, and the success of the novel Ramona. While the Mission Revival took inspiration from local Spanish and Mexican buildings, Spanish Colonial Revival looked overseas to Spain to borrow elements. The style perpetuated the cultural myth and romantic fiction that California was the New Spain of North America. In the 1920s and 1930s, house plans using the Spanish Colonial Revival style frequently sold from books produced by contractors and builders. The two most influential architects of this style in Southern California were Bertram Goodhue (1869-1924) and George Washington Smith (1876-1930). The revival swept from California to other regions with Hispanic pasts: New Mexico, Southern Arizona, Florida, and Texas. Like the Craftsman bungalow, Spanish Colonial Revival homes spawned a furniture and home accessory market. In 1929, Barker Brothers hired the Mason Manufacturing Company to produce a 24-piece line of furniture called Monterey that stayed in production until 1943. While most Spanish Colonial Revival homes were painted white, O. A. Malone of California Stone Product Corporation developed a stucco/plaster that contained colored paint in 1927. This colored plaster is evident on the Santa Fe Depot (1930), now the Fullerton Station, at 120 E. Santa Fe Avenue, which still has its original orange "jazz" plaster. 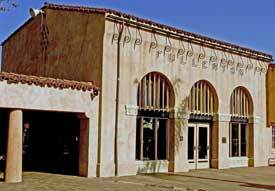 In July 1919, the Fullerton Board of Trade (later the Chamber of Commerce) and the City Council made history by passing a resolution establishing the Spanish Colonial Revival style as the architectural style for public buildings in the city. 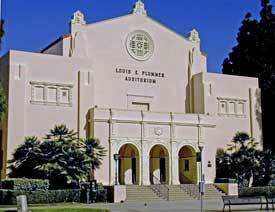 Fullerton became one of the first cities in the nation to establish a uniform style of architecture. Thereafter, a large number of public buildings - the high school and its auditorium, library, post office, and city hall - were designed in this style. 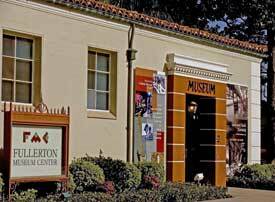 The style was ideally suited to single-level detached homes, and Fullerton has an amazing array of Spanish Colonial Revival dwellings throughout the city that were built from 1920, until the start of World War II. Significant Spanish Colonial Revival residential properties in Fullerton include the Muckenthaler Estate (1923), now the Muckenthaler Cultural Center at 1201 W. Malvern Avenue; the Grieves Apartments (1924) at 529-531 E. Commonwealth Avenue; the Clinton Smith House (1924) at 736 N. Euclid Street;; the William Wintter House (1926) at 327 W. Orangethorpe Avenue; the Gowen House (1928) at 1600 W. Valencia Drive; the Dewella Apartments (1929) at 232-236 E. Wilshire Avenue; the Foster House (1929) at 524 E. Commonwealth Avenue; the Mills House (1937) at 500 W. Fern Drive; and the Cleaver House (1929) at 519 W. Fern Drive. 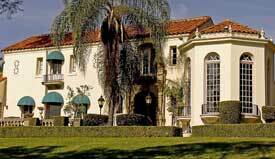 In the 1920s, Mayor Harry Crooke formed a syndicate to develop the Skyline Park area ( Frances Avenue, Luanne Avenue, Cannon Drive ) as a showcase for Spanish Colonial Revival homes. In this neighborhood no two homes were designed and built the same. Although in-fill and newer homes have entered the area, the various sizes and shapes of this style are still evident throughout the neighborhood. Bertram Grosvenor Goodhue: Architect and Master of Many Arts. Ed. by Hartley Burr Alexander. New York: Da Capo Press, 1966; reprint of 1925 volume. Gellner, Arrol. Red Tile Style: America 's Spanish Revival Architecture. New York: Viking Studio, 2002. George Washington Smith: An Architect's Scrapbook. Ed. by Marc Appleton. Los Angeles: Tailwater Press, 2001. McMillian, Elizabeth. California Colonial: The Spanish and Rancho Revival Styles. Atglen, PA: Schiffer, 2002. McMillian, Elizabeth. Casa California: Spanish-style Houses from Santa Barbara to San Clemente. New York: Rizzoli International, 1996. Newcomb, Rexford. 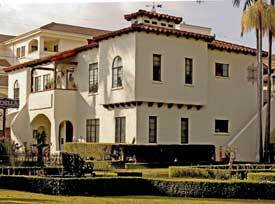 Spanish-Colonial Architecture in the United States. New York: Dover Publications, 1990. Reprint of 1937 volume. Renick, Roger, and Michael Trotter. 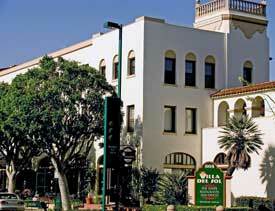 Monterey: Furnishings of California 's Spanish Revival. New York: Schiffer Publishing, 2000. Spanish Homes of California: A Collection of Photographs Representing Spanish Influence in Home Building as Interpreted by the Best Architects of Southern California, Along with Sketches and Plans for Encouragement of This Style. Long Beach: Roy Hilton Company, 1927.